Every soviet poster no matter the date of creation bears a stamp of expressiveness and graphical quality. The attention to details is awesome. The scope of techniques is endless. Soviet posters are a treasure chest with inspiration for any graphical designer, not to mention the seeing pleasure itself. And what's important, every Soviet Poster has a historical reference essential for understanding the layers of meanings it carries through time. We welcome the Day of the Soviet Railworker! 1957, image from Princeton University Library. Railroads are everything for a country as big as Russia. Currently Russian Federation has an area of 17 mln. square km. This is almost twice as big as Canada or China or the USA. So, advanced means of transportation , which are capable of transporting large quantities of goods between 85 federal subjects (states) and 14 neighboring countries were absolutely essential both now and always. In the nineteenth century Russia being an agricultural country managed to create its first steam locomotive only in the thirties – almost thirty years later than England. The first commercial railway line took off in 1851, it linked two major Russian cities – imperial capital Saint-Petersburg and Moscow, covering 800 hundred km. Later Russian railroad development was carried out at fast pace as the monarchy considered railroads to be a perfect way of increasing the defense potential of the country. During the First and Second world wars Russian railways suffered great losses of more than 60% of its rail network. After the WWII the tracks were rebuilt and reached 150 000 km. of length. Now Russian railroad network is approximately 87 000 km. being the second largest in the world after the USA with its 250 000 km of tracks in operation. This double cut in length was caused by the soviet republics declaring independence during the collapse of the Soviet Union in 1991 and privatizing rails on their land. In the Soviet times railways were the main means of transportation, with thousands of people working in the industry. And they had their own professional holiday – the Soviet Railworker's day. The poster above dates 1957 and commemorates the valuable contribution of Russian railworkers to the economical and social raise of the country after the war. 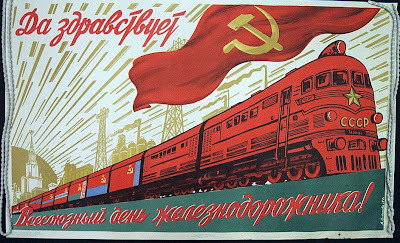 Note that each car of the train carries the flag of a Soviet republic -- another layer to the allegory. Note as well that the train is proceeding from the Kremlin to the right, which generally corresponds to East, underlining its role as a transmitter of Soviet power into the less populated/industrialized/civilized parts of the Soviet Union. The rays of energy also emit from the Kremlin. Мой сосед Тоторо – самый крупный сайт. Thanks for coming! Drop me a line at lastmile@yandex.ru anytime.